We report the first case in literature where a child with giant prolactinoma has presented with epistaxis as a primary complaint with normal serum prolactin level. A thirteen-year-old child had presented with bleeding from right nostril about eight months back. The bleeding was moderate, almost daily soaking a handkerchief every day. He started taking some homoeopathic medicine which decreased the quantity of bleeding but not the frequency. Later he was also prescribed some nasal decongestant drops by the treating doctor, which resulted in some control temporarily. Patient had no CSF rhinorrhoea, had occasional feeling of nasal obstructions more so after the bout of nasal bleed, he had no respiratory problem. On anterior rhinoscopy examination, turbinates were hypertrophied along with deviated nasal septum toward left side. There was no evidence of any nasal mass or active bleeder. After about three months, he noticed diminution of vision in right eye which progressed to loss of vision in a month's time. He was referred to us at this stage. There was no headache, vomiting, blurring of vision or any complaints pertaining to endocrinopathy. Patient was fully conscious with Glasgow Coma Scale (GCS) 15/15. His pulse was 66/min, BP 110/74 mm Hg. There was no vision in right eye. On left side, vision was 6/6 partial. Fundus examination showed bilateral optic atrophy, more in right eye. On examination, there were no clinical features of any endocrine abnormality. In view of visual deterioration, MRI of brain was done which revealed sellar-suprasellar, solid-cystic mass. The cystic component was predominantly suprasellar and hyperintense on T1 and T2 with peripheral rim enhancement. The solid component was both sellar-suprasellar and isointense on T1and T2 with contrast enhancement. The mass was encasing both cavernous sinuses, extending up to bilateral optic canal, encasing canalicular segment of both optic nerves. It was posteriorly extending into interpeduncular fossa and anteroinferiorly into nasopharynx, posterior nasal cavity, eroding the basisphenoid, clivus and posterior ethmoid and sphenoid sinuses [Figure 1]. 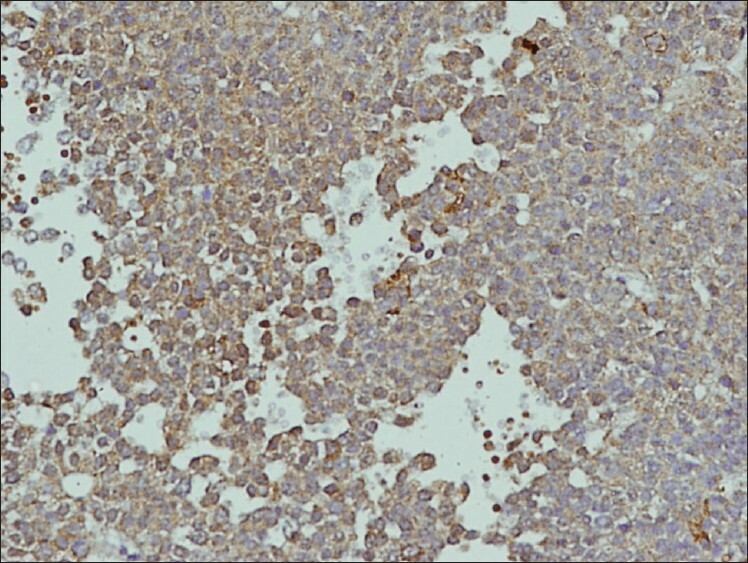 His routine investigations included Hb 10.8 gm%, Hct 37.7%, TLC 9000/micL, DLC -P64, L32, E4 M0.,platelets 1.59 lac/micL. Bleeding time was 1.25 min, clotting time 5.10 min, prothrombin time 15.2 s(control 16 s). His hormonal profile included FT3 -1.35(2.0-4.4 pg/ml. ), FT4 - 0.40(0.93-1.7 ng/dl. ), TSH-7.6(0.27-4.2 mic IU/L). Serum prolactin was 203.7(86-324 mic IU/ml. ).Growth hormone was 5.4 ngm/ml(< 7 ngm/ml). Patient was operated by transcranial route. Right frontotemporal craniotomy and decompression of tumor was achieved via inter-optic and carotico-optic spaces. Tumor was well encapsulated, of variable consistency and highly vascular. Near total decompression was achieved. Child had some bleeding from nose for about two days which settled in due course of time. In postoperative period, child also had diabetes insipidus which settled in three days. Post operative scan showed near total removal of the tumor. Histological examination revealed pituitary adenoma which was staining strongly positive for prolactin and negative for TSH, LH, ACTH and somatostatin [Figure 2] and [Figure 3]. Epistaxis can present for several months in pituitary adenoma. V D'Costa et al.,  have reported a case where pituitary adenoma remained undiagnosed for three years with history of intermittent epistaxis. The pituitary adenoma in our case presented with epistaxis and remained undiagnosed for eight months. Despite the complaint of visual deterioration, the child never had a CT/MRI study of brain. Anterior rhinoscopic examination was essentially normal. The hook effect occurs when excessive antigen is added to a hand held assay (HHA), which then results in false negative. In this assay, the amount of antigen exceeds the finite amount of colloidal gold antibody or the colored labeling material. The excess unlabeled antigen migrates across the membrane more rapidly than the heavier color-labeled antigen, thus saturating or binding all the binding site on the capture antibodies.When the color-labeled antigen arrives, there are no binding sites available and the colored antigen cannot create the colored test line that would produce a positive result. This, in turn, presents the user a false negative result (hook effect) even though high level of the antigen is present. The pituitary adenoma in our case presented with epistaxis and remained undiagnosed for eight months. Despite the complaint of visual deterioration the child never had a CT/MRI study of brain. Anterior rhinoscopic examination was essentially normal. The pituitary adenoma remained undiagnosed initially and became invasive in about eight month's time. Pituitary adenoma can also present with epistaxis in children and should be considered as the differential diagnosis along with other uncommon causes. It should be further suspected if there is associated visual loss and in normal anterior rhinoscopy. However, posterior rhinoscopic examination in such cases may pick up the lesion at early stage. Moreover, invasive prolactinoma can have normal prolactin levels due to hook effect. 1. 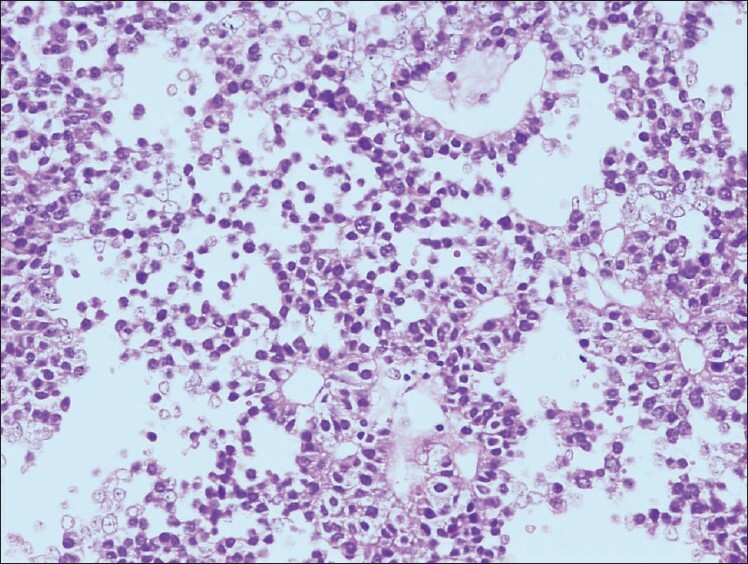 Cohen ZR, Marmor E, Fuller GN, DeMonte F. Misdiagnosis of olfactory neuroblastoma. Neurosurg Focus 2002;15:12:e3. 2. Godey B, Morandi X, Le Gall F, Feat S, Brassier G, Le Clech G. Pituitary adenomas with infra-sellar extension into the nasopharynx. J Laryngol Otol 1999;113:1109-11. 3. Kleinschmidt-Demasters BK, Lillehei KO. Pathological correlates of pituitary adenomas presenting with apoplexy. Hum Pathol 1998;29:1255-65. 4. Imamura J, Okuzono T, Okuzono Y. Fatal epistaxis caused by rupture of an intratumoral aneurysm enclosed by a large prolactinoma-Case report. Neurol Med Chir (Tokyo) 1998;38:654-6. 5. Molitch ME. Prolactin-secreting tumors: What's new? Expert Rev Anticancer Ther 2006;6 Suppl 9:S29-35. 6. Hori A. Suprasellarperi-infundibular ectopic adenohypophysis in fetal and adult brains. J Neurosurg 1985;63:113-5. 7. Luk IS, Chan JK, Chow SM, Leung S. Pituitary adenoma presenting as sinonasal tumor: Pitfalls in diagnosis. Hum Pathol 1996;27:605-9. 8. Hori E, Akai T, Kurimoto M, Hirashima Y, Endo S. Growth hormonesecreting pituitary adenoma confined to the sphenoid sinus associated with a normal-sized empty sella. J Clin Neurosci 2002;9:196-9. 9. Goel A, Phalke U, Cacciola F, Muzumdar DP. Giant pituitary adenoma invading the clivus. Neurol India 2005;53:105-7. 10. D'Costa RV, Kalk WJ. Bromocriptine-sensitive acidophil-stem-cell adenoma co-secreting growth hormone and prolactin - A case report. 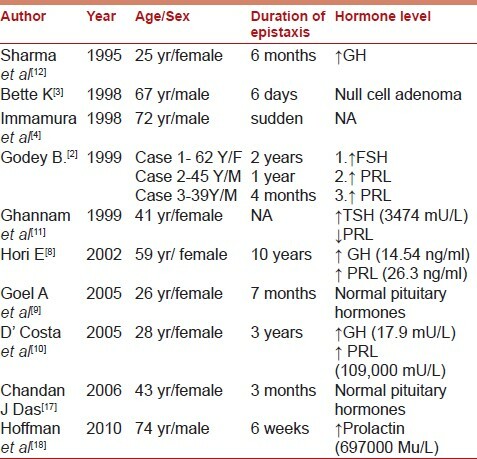 Endocrine Abstracts 2005;9:198. 11. Ghannam NN, Hammami MM, Muttair Z, Bakheet SM. Primary hypothyroidism-associated TSH-secreting pituitary adenoma/ hyperplasia presenting as a bleeding nasal mass and extremely elevated TSH level. J Endocrinol Invest 1999;22:419-23. 12. Sharma K, Tyagi I, Banerji D, Chhabra DK. Intranasal Pituitary adenoma with epistaxis in an Acromegaly - An unusual presentation. Indian J Otol Head Neck Surg 1995;47:25-7. 13. Murphy FY, Vesely DL, Jordan RM, Flanigan S, Kohler PO. Giant invasive prolactinomas. Am J Med 1987;83:995-1002. 14. Batchelet AR. Wills eye resident case series. Rev Ophthalmol 2010;17:90. 15. Barkan AL, Chandler WF. Giant pituitary prolactinoma with falsely low serum prolactin: The pitfall of high-dose hook effect": Case report. Neurosurgery 1998;42:913-5; discussion 915-6. 16. Petakov MS, Damjanoviæ SS, Nikoliæ-Duroviæ MM, Dragojloviæ ZL, Obradoviæ S, Gligoroviæ MS, et al . Pituitary adenomas secreting large amounts of prolactin may give false low values in immunoradiometric assays. The hook effect. J Endocrinol Invest 1998;21:184-8. 17. Das CJ, Seith A, Gamangati S, Goswami R. Ectopic pituitary adenoma with an empty sella. AJR Am J Roentgenol 2006;186:1468-9. 18. Hofman R, Franken AA, Rosingh HJ. Just epistaxis? Neth J Med 2010;68:227-8.